Despite placing in the top 12 at the World Championship Finals for 16 of the previous 17 years, it wasn't until 2004 that Bluecoats broke into the top six with "Mood Swings." Conceptually, the show was the ultimate manifestation of the corps' swing identity that had often been the trademark of the Ohio group for so many previous seasons. No matter how often the corps veered into a contemporary symphonic jazz trajectory, it always eventually came back to swing to rediscover its roots. After starting the show with a 64-count percussion riff, the brass section came in with a blast of the classic swing tune, "In the Mood," recorded by jazz great Glenn Miller in the 1930s. This grounded the show in the swing tradition by presenting a canvas upon which more contemporary offerings would be painted. The color guard unleashed wild purple, red and orange flags for the fanfare, which rather shockingly then went totally out of key in the horn line; a clever way of informing the audience that what they would soon experience would be music unlike anything they had heard from the corps in previous years. The sudden key shift in the last measure of the fanfare was akin to wiping the slate clean. Samuel Hazo's "Ride," originally written for concert band, pointed the way to the more symphonic jazz styling the corps would explore in the coming years. Not really swing in the traditional sense, it still conveyed a lilting sensation amidst forward propulsion inspired by a semi-terrifying ride Hazo had through the countryside. Gordon Goodwin contributed "Hunting Wabbits" to the show. Originally written for his Big Phat Band, the work played off Elmer Fudd's chasing after Bugs Bunny with a cartoonish musical humor. A sequential color guard rifle ripple ended the offering as the front ensemble brought the manic indulgence to a quick and quiet end, akin to slamming the lid on a boiling pot. It was in "One Day I'll Fly Away" (from "Moulin Rouge") that the wordplay of the show's title was finally grasped. The emotional heart-wringing melody represented a complete swing through a variety of contrasting moods, diametrically opposite in character from the lighthearted impishness of "Hunting Wabbits." A lovely ballad that took its time to breathe and emotionally exhale, "One Day I'll Fly Away" allowed us to grasp the idea that the show perhaps wasn't about swing in the jazz sense, but may have been more about the corps using the moods to swing toward its new identity. That identity was one that would take it ever higher and help create a buzz about the corps as one of the major players on the field each year. But if we thought the swing (verb) through and past the musical style of swing (noun) was complete and final, the corps had a final surprise in store. A vivacious drum feature leading into a tag combining elements of "Ride" and "In the Mood" brought the corps back to its swing roots, letting us know that while the creative staff might be able to take the Bluecoats out of swing, one can't take the swing out of the Bluecoats. 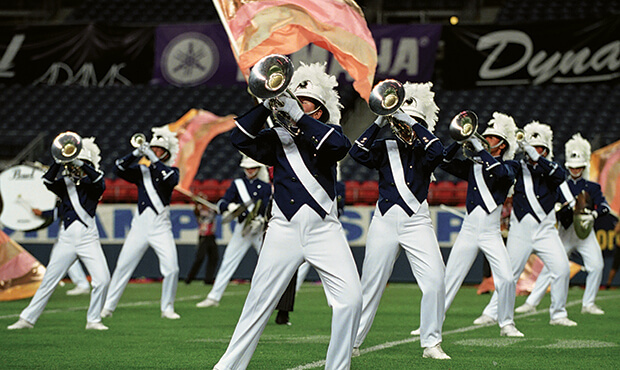 This week only, you can save on 2004 World Championship Audio and Video Performance Downloads on the DCI Fan Network. Buy the 2004 Bluecoats Video Performance Download. (Available this week only for $3.99. Regular price: $4.99.) Buy the Audio Performance Download bundle of all 12 Finalists from 2004. (Available this week only for $15.99. Regular price: $19.99.) Offer ends Monday, Nov. 14 at 8:30 a.m. ET.